How to explain the shift? The short answer is that on the meditation retreat, I very deeply saw the difference between the inner noises and the inner voice. In part II, I introduced the concept of “noise.” Some noises come from the outside, like what society or your parents say. However, what I most often talk about is your own inner, mental-emotional noise. On one level, mental-emotional noise is the compulsive thinking that plagues roughly 99.5% of contemporary westerners. On a deeper level, it’s the feeling-states / energetic-habit-patterns underneath most that compulsive thinking—i.e. shame, apathy, irritation, fear, restlessness, craving or, say, that vague existential unease I strongly felt before my first one-way ticket. These inner experiences are noises because they drown-out the “inner voice”—that deep intuitive knowing that says life is simply better when we harmonize our authenticity with empathy, care and relational integrity. At first, it seemed to me like my inner voice / deepest authenticity was very self-serving; asking, “what do I want and need in order to be okay?” However, as I’ve gone on, I’ve started to uncover that the eye to others is a fundamental part of our basic human nature, of our deepest authenticity. A lifetime in a noisy culture might obscure us from that basic truth, but as we cultivate inner awareness and see through the noises, our deepest intuition will start steering us a different direction—at least it did for me in my first romantic relationship after beginning meditating. We had initially dated while I was running my electronics business, both of us entering into transitional periods. We went different directions, but with the love still strong, we tried long-distance, connected at various points along the way and spoke big words about our dreams, intentions, desires and commitments. We had a grand plan to indefinitely link our paths. And yet, around that time, I was so enraptured with my authenticity journey that in spite of my big words, I was realizing that I couldn’t wholeheartedly give myself to a relationship—I tried to bury and power through that feeling, continually vocalizing my desire to be in relationship. Nonetheless, that deeper feeling kept seeping out through my choices and actions. She called me on it. From there, it was a slow and painful crumbling. In the aftermath of our separation, even though the outcome was what my inner voice spoke—continuing my solo journey—I wept uncontrollably for the first time since that initial meditation retreat. It wasn’t because we separated or went different ways. Instead, it was because I very deeply felt into how I had acted irresponsibly, violated someone’s trust and hurt them quite a bit. My years of meditation didn’t get me to act perfectly authentic; instead, they taught me how a deep part of myself found it incredibly painful to cause harm in the world. It’s no wonder that the Yoga / Hindu tradition revolves their entire ethical system around the value of non-harmfulness. It’s not simply because it’s a good or noble quality to have. It’s because it’s a fundamental impulse in our being—to love. We thrive and find joy in connection with other beings. We truly want to do right by the world. The pain I felt by causing harm to my beloved uncovered in me a natural and enduring desire to be kind, to carefully look at the effects of my actions and be intentional about not causing harm. It’s difficult to quantify this desire, but one way it’s showed up in both romantic and platonic relationships, is that I’ve been way more committed and consistent at being truthful with others, even when it’s scary and difficult to do so. The overarching theme in this section is that “going inside” and becoming very intimate with our inner reality naturally leads to a deeper connectedness with others. My route of “going inside” has been mindfulness meditation. It is a very solid path, but it probably doesn’t speak to everyone’s temperament. For others, perhaps it comes through extensive time in the wilderness, traveling endlessly, solo sailing trips, psychotropic drugs, various religious and spiritual practices, and who knows what else. Whatever your route, I highly recommend taking extending periods of time to explore it—an hour, a day, a week, a month, a year or simply whatever you have. This is an essential part of the journey. Although, going inside is only half the equation. Fifteen months after that first 10 day retreat, I began what was to be a four-year spiritual journey with a service residency at the Upaya Zen Center. It was a well-established spiritual community with around a dozen full-time residents. We all worked, ate, meditated and counseled together. A couple months after leaving Upaya, I spent a few days crashing at a friend’s house I had stayed at before Upaya. He commented that I had done many little gestures that I hadn’t done the last time. Sweeping the kitchen. Buying a few extra groceries and leaving them there. Asking very explicitly about boundaries and being intentional about maintaining them. Giving more space in conversation, allowing more gaps for them to speak rather than jumping right in with my opinions and thoughts. Living in that spirit community left me feeling more natural warmth and attentiveness towards others. A desire to help and do nice things, even when I didn’t have to or when it might be inconvenient for me. Although the meditation and regular teachings on compassion and a life of service surely aided, what transformed me above all was simply living in such close-quarters with a group of people fully committed to being kind to one another. In other words, the changes didn’t come through being solitary, but by actually engaging in intimate relationship with good-natured humans. 1) Subtraction. Going inside, seeing through the noises and uncovering what our inner voice really says. 2) Addition. Engaging outwardly and hard-wiring goodwill into our relational habit patterns. Reading books or doing various contemplations on the value of “the eye to others.” Or, perhaps, formally diving into a single quality, like generosity, and practicing giving to others our time, money, words or attention without expecting anything in return. After Upaya, it was clear my spiritual journey was to be a process of swinging between poles of “going inside” through intensive retreat and “engaging outwardly” through intentional generosity, learning skills to share with others, and deeply engaging with communities, like my current seven month stay on a small family farm. As I’ve gone on, the swinging from inside to outside has become less and less intense—in other words, while it’s been helpful to primarily focus on one pole for periods of time, my inner voice has increasingly shown me how to do them both simultaneously. Nowadays, I meditate a little every day, maintain a reflective attitude and self-regulate as things arise. I also engage outwardly every day, keeping myself in kindness “ready position,” sensitive to the needs of others and willing to connect and help out as situations present themselves. Ultimately, this is where sincerity practice leads—honoring our own needs while being kind to others, not because we should, but because we have such a strong intuitive sense of what the inner voice truly desires. The first major task for most people is authenticity—daring to follow the call to adventure and breaking free from all the fears and other noises that try to keep us living on a more superficial level. Making this first leap is one of the greatest milestones in our lives. As we begin living true to ourselves, one common obstacle is living authentically to the point of being brazen, self-centered and inconsiderate of others. There’s nothing inherently “wrong” with this much authenticity, but one of my strongest convictions is that when we truly dive into ourselves and figure out what our highest self wants, what we find is a desire for that authenticity, but only when it’s expressed through a life of love and kindness. These days, I’m not perfect at living this vision. Sometimes I can be aloof or a little too focused on my own agenda, not taking into account how that impacts others. Sometimes I’m overly considerate of others and then neglect my own needs and desires. Sometimes I just don’t feel like being kind and outward, and instead go for neutral and non-harming. Sometimes when the noises are particularly loud, I don’t feel like listening to my inner voice and opt for something comforting and mundane, like watching a movie or playing internet chess. The point isn’t to become perfect. It’s simply to have a sense of direction. In this essay, I shared how a lifetime of experiences has shaped me, and how it has produced some real changes. I’m still working on it, every day, I’m still fine-tuning what it means to live from my deepest inner voice. For me, this is the most interesting and exciting way to use my life. 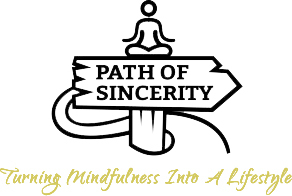 The Path of Sincerity is founded on “going inside,” uncovering our inner voice and, in turn, taking the risk of putting it into action—the more we do this, the more we naturally live from a place of spaciousness, truth and love. It’s not easy, but it’s absolutely worth it.